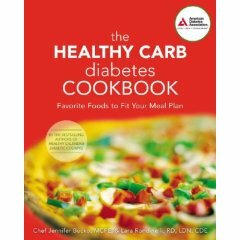 I recently received a copy of The Healthy Carb Diabetes Cookbook to review for you. As the title states, this is a cookbook designed for diabetics. The just under 200 recipes meet nutritional guidelines of the American Diabetes Association. The cookbook emphasizes healthy carbohydrates – whole grains, fruits, and vegetables – stating that they are permitted with those who have diabetes and should be enjoyed. The recipes are divided up into meal times: breakfast, lunch, dinner, sides, and dessert. These labels are printed on the sides of their corresponding pages to easily find each section. Every recipe comes with a nutritional analysis and a cooking tip. Chef Jennifer Bucko, MCFE – She is the Associate Dean and Chef Instructor for Robert Morris College Institute of Culinary Arts and was the Excutive Chef of the MarketPlace Food Store in Chicago. Lara Rondinelli, RD, LDN, CDE – She is the Diabetes Center Coordinator at Rush University Medical Center in Chicago and an instructor at Rush University. She has also served on the board of the Chicago Dietetic Assocation. The recipes are simple, easy to follow, and create healthy and tasty dishes. I feel this cookbook is for anyone wishing to find healthier recipes, not just diabetics. You can cook dishes like Chicken Pesto Panini, Asian Beef Kabobs with Brown Rice, Jambalaya, Mediterranean Tortellini Salad, Banana Pudding, and Berry Sorbet. This cookbook is in black and white, including the handful of pictures. Now, I like lots of colored photographs of food in cookbooks, so I would have preferred more color in this particular cookbook. The biggest downside to this cookbook is that it uses Splenda as a sweetener, and I now avoid Splenda since I believe it causes more harm to the body than good. I’d actually rather use regular sugar over Splenda, but that’s not the healthiest option for diabetics. Other alternatives to the Splenda include sweeteners like mashed up bananas, applesauce, cinnamon, alcohol-free vanilla extract, or even organic honey. Each of these sweeteners would bring a different taste to the recipe, so I would need to experiment with amounts. I did enjoy many of the recipes. I found them to be relatively healthy and easy to create. I’m even saving some of the recipes for future use (and tweaking). If you’d like a copy of this cookbook, let me know in the comments section by Monday, June 23rd. I’ll use a random number generator to pick the winner. 1. Add cooking spray and canola oil to a large nonstick skillet or wok over medium-high heat. Add broccoli, sugar snap peas, and carrots, and stir-fry for 4 minutes. 3. Serve stir-fry over rice.